âFlower frame made of pine, smooth, durable, metal screw connection reinforcement, high stability, with good load capacity. âSurface treatment with carbon baking, color symmetry, anti-corrosion mold, green and healthy. âMulti-storey design, small footprint, large space, can be placed more green plants, the perfect storage capacity, so that home more clean. âRefer to the installation instructions, manual assembly, simple and convenient. 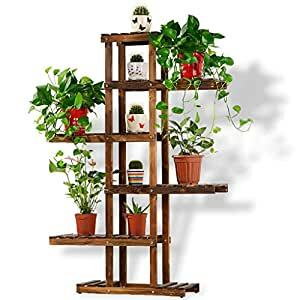 Features: Environmental pine wood, natural health, anti-corrosion carbonization treatment, long durable, multi-storey design, can be placed more, can be used multi-purpose, do flower racks, shelves, bookshelves, storage racks.